Cervical Strain/Sprain – What It Is? 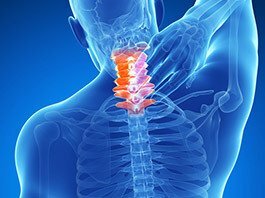 People who are involved in motor vehicle crashes or who take hard falls in a contact sport or around the house may get a real “pain in the neck.” This pain can result from a ligament sprain or muscle strain. The seven bones of the spinal column in your neck are called cervical vertebrae. They are connected to each other by ligaments, which are strong bands of tissue, like thick rubber bands. A sprain is a stretch or tear in the ligament resulting from a sudden movement that causes the neck to extend to an extreme position. For example, in the rapid deceleration of a car crash, your head and neck can stretch far forward before stopping.